Really, I could never sew for a living. I realized yesterday, as I was happily stitching along on a project for my cousin’s birthday, that my best sewing comes when I’m inspired by who the gift is for. The reason I say I couldn’t sew for a living is because part of my realization yesterday was that my best work happens when I’m sewing with a specific person in mind. Yesterday it was my four year-old cousin. (yes, you get cousins younger than your own children when your father comes from a family of fifteen) He’s a soft-spoken, chubby-handed little boy in gold, wire-framed glasses who knows more about tractors than most grown men. He’ll drool over glossy Case IH literature like some kids drool over chocolate frosted cake. So in the final hours before his party (and in the final minutes trying to take three pictures by ugly overhead light), I became inspired to make him a tractor to lay his head on, to usher him off into his own, personal, machinery dreamland. And I tell you the project couldn’t have gone more smoothly. Each piece of fabric fell into place–the colors, the prints. Not a stitch (well maybe one or two) fell out of line. It just came together perfectly. And not because I think I’m the end all of pillow-makers, but because I think that when I’m sewing from my heart everything falls perfectly in to place. Wonderful cushion, just perfect. 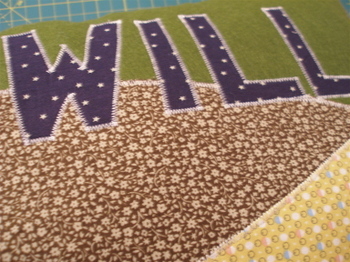 I love it when sewing projects work out like that. So cute! Elliot would die for a fire truck one. Hope you’re feeling well. I was just thinking of you today. OH MY!!!! 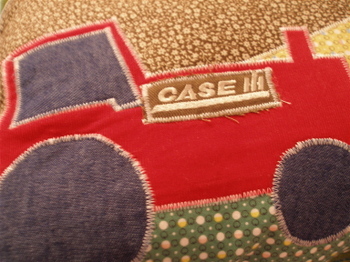 love the “fields” in your tractor pillow!!! Adorable!!!! I’m also wishing you and yours a blessed and happy new year!!! that pillow is totally adorable! well done. That is just beautiful Molly! So thoughtful and sweet. oh – i think it turned out great! i love your tractor. The pillow is precious, I have a little nephew that loves tractors and would be thrilled to receive something like that. I completely understand what you mean. I can draw when I’m inspired and I’m guided from a passion or creative from with in. Other than that I seem to just be able to doodle??? I just love your description of the little man – and I am sure that he will be over the moon with his fabulous new pillow. Such a great gift for a little boy. 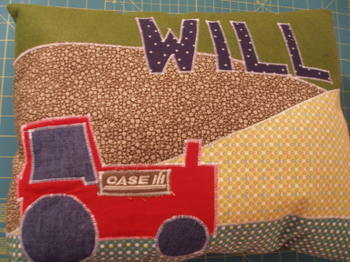 What a wonderful pillow for your sweet little tractor lover. I so agree with your sentiments about sewing, when I’m sewing from the heart it’s always better. The pillow is so sweet Molly. I agree, it is so much easier for me to create with a person in mind. so great!! his name in stars and those great fabrics in the background too. what a lovely gift. that pillow is awesome! i only wish i were that creative, whether with someone in mind or not. I love seeing the projects you do Molly. 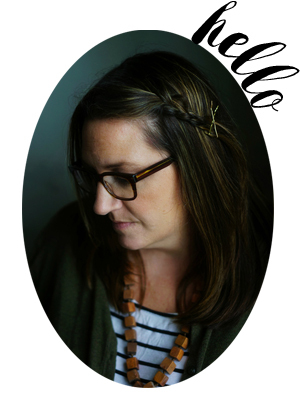 You are very talented, but unlike other craft-bloggers they also seem realistically accomplishable. It goves me hope that someday I WILL sew and I WILL work with clay. Thanks Molly and Happy New Year!